To have information on getting to and around Rome , going from and to airports in Rome, getting information about trains in Italy, buses in Rome, Taxis in Rome, and other tourist transportation options. 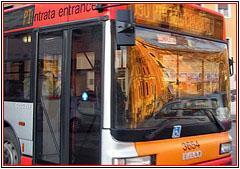 There is an extensive bus system in Rome that covers all Rome city during 24 hours, you can be amazed of number of buses. Italian buses have three doorsand you board by either the front or the back door; the middle door is for getting off the bus only. When you board on the bus, you must punch your ticket in the machine at the back of the bus, this stamps a time on the ticket and ticket is now valid for the next 100 minute or day (if you bought the daily) on any of the city buses. Regrettably, there are no routines Tickets can be bought at Tabaccherie, some bars and metro station where you can buy a 100 minutes ticket for 1.50 € , a daily ticket for 6.00€ , a monthly ticket for 35.00€ or a yearly ticket. at the bus stops so if would like to go somewhere by bus, it is best to ask your Hotel Receptionist which number bus(es) you should take. The receptionist should have a bus Direction which shows all the routings. Almost in each Piazza (square) you can find a taxi staion. 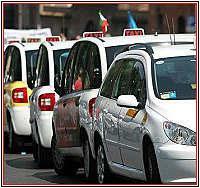 It is better to use the yellow or white taxis; private taxis are not usually metered. If you call Taxi to be picked up at your hotel you will also have topay an extra charge. Extra supplements, also, for luggage and journeys from/ to the airport. Useful Radio taxis numbers: 06 3570 ; 06 661717 ; 06 6645 ; 06 5551 ; 06 6696.